Constant research for innovative solutions. Strong commitment to quality and attention to detail. An unmistakable style that knows no borders. These are the fundamental values that guide us, the same ones you will find in our products. Since we’ve been by your side for the last half – millennium, sharing with you the same passion. Devoting ourselves to satisfy your needs with enthusiasm and dedication, supplying authentic, durable and beautiful products. 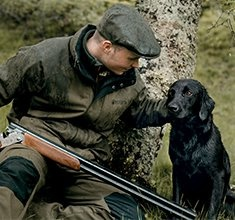 Hunting in hot climates, dog training, travelling, leisure: Beretta technology and comfort are by your side even in summer, whatever you are aiming for. Whether it’s aspens and alders that hide the darting flight of woodcock and grouse – or the open grass plains of pheasant and quail – you are in your element. The crisp fall morning air heightens your senses as the sun warms your face. You once again marvel at the gracefulness of your trusty German Shorthair at rock-solid point. It is a scene you’ve both played out many times before. Beretta offers specialized solutions and technology for both professional shooters and simple enthusiasts to help improve performance on the range. The most authentic characteristics of the Beretta genome, perfectly captured in each new Vintage Years collection.